Home »	Fix » How to fix error code 1962 "No Operating System Found"? Issue: How to fix error code 1962 "No Operating System Found"? When I downloaded the Windows 10 Fall Creators Update to my PC, the system got stuck at boot with an error code 1962 saying that “No Operating System Found.” I did a hard reboot and the system eventually loaded, but then the next day the same error re-occurred. What can I do? The PC stuck at boot is a common problem in Windows 10 OS regardless of device model. However, there’s one common problem which is related to Lenovo computers only – the Error Code 1962. The error indicates “No Operating System Found” which causes immediate panic to many Lenovo users. However, in most cases, Error 1962 fix can be performed relatively easy, and we will explain how to do that in this article. 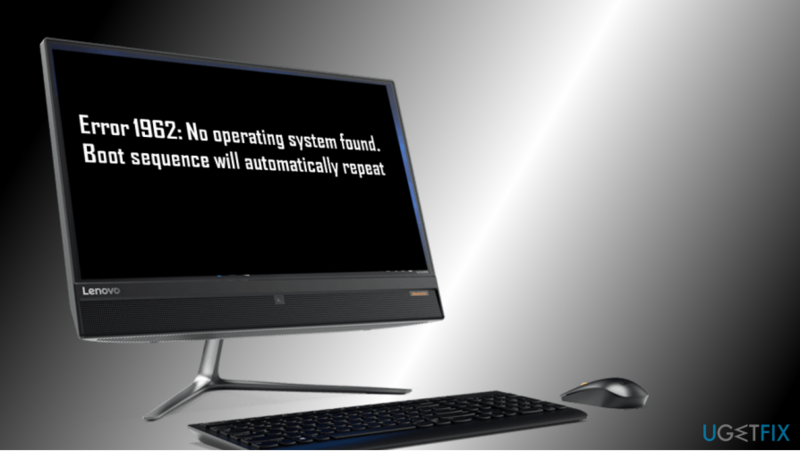 Typically, Error 1962 – No Operating System Found occurs on Lenovo computers at Windows boot, after the restart. Although experts haven't really found the relation between the error code 1962 and the software installed before the problem occurs, Lenovo users keep posting reports on Microsoft’s official support page judging the free Windows 10 upgrade (earlier), and it’s feature updates (Creators Update, Fall Creators Update) for causing the problem. Such speculations are somewhat contradictory. If the “No Operating System Found” error with a code 1962 showed up after the installation of Windows 10 or its updates, it’s more likely to be a coincidence. If you are pretty sure that the upgrade or installation of software caused the problem, you can run Windows diagnostics at boot or perform a clean install. 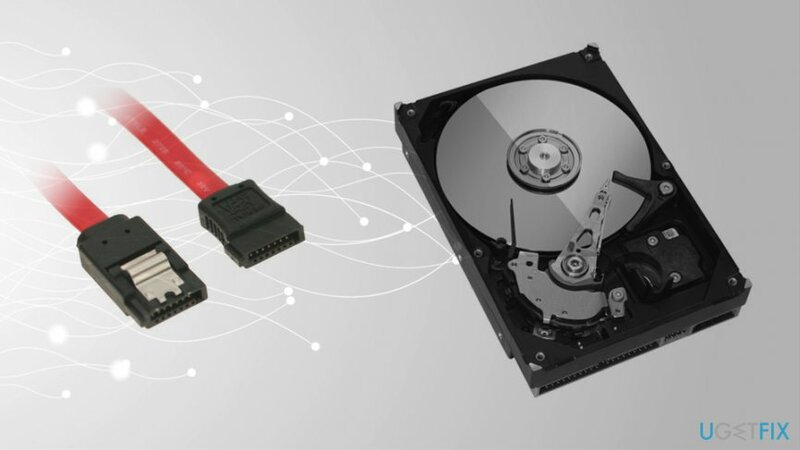 However, in most of the cases the problem comes up from either the faulty HDD or SATA cable which is connected to the well functioning HDD and motherboard. Thus, to fix Error 1962: No Operating System found, you should check which one of these two is malfunctioning. 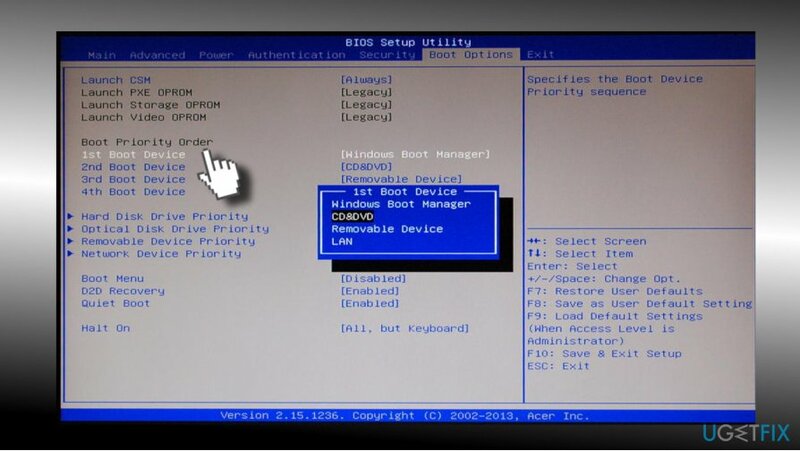 Most people managed to fix Error 1962 No operating system found on Lenovo PCs by performing a hard reboot. However, that’s not a permanent solution, so it’s just a matter of time until the error shows up again. To fix the error permanently, check the condition of the HDD and SATA cables. To check if a faulty HDD drive is causing error 1962, you have to have another properly working PC. Remove the HDD and connect it to the other computer. If the latter detects and allows accessing the HDD, then the culprit (most probably) is the SATA cable, so you should change it to a new one. If the full-working PC cannot detect the HDD, you may need to change it. Unfortunately, it means that you are going to lose all the data stored on it. If you saved a lot of personal information on the HDD, try contacting a professional IT technician who may recover at least a part of data. IMPORTANT: be careful when performing the following steps because inaccurate move can result in PC’s integrity violation. The guide given below requires altering computer’s basic input/output system (BIOS) which, if not performed according to steps, can lead you to computer-related issues. 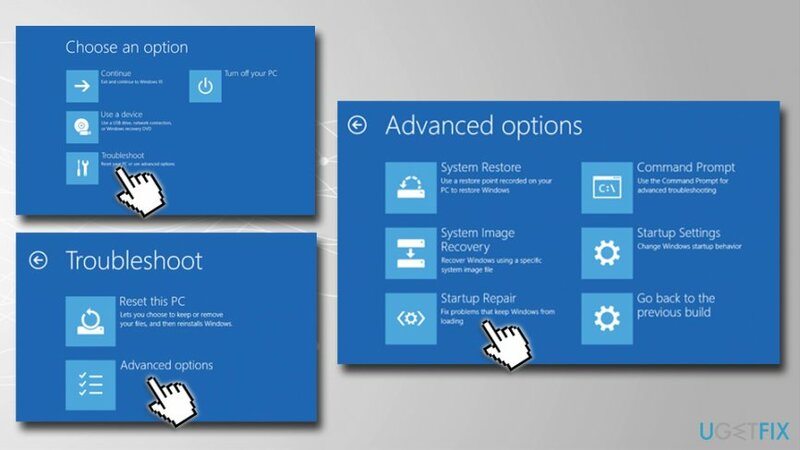 Note: you can use automatic system repair tools like Reimage – it can fix most of Windows-related problems without having to reinstall the operating system. Once the system returns the error No Operating System Found error 1962, press and hold Ctrl + Alt + Del buttons. Now the system should reboot. To switch to BIOS setup, press F12 several times. 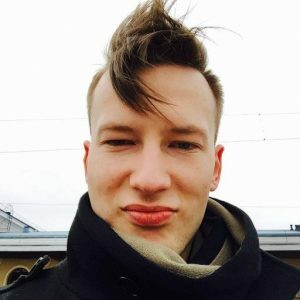 When Setup written box occurs, press Enter. Now select Startup tab at the top of the window and select CSM. Click Now select the Enabled option. Find Boot Priority and press Enter. Now change the Legacy First to UEFI First. After that, press F10 key and select Yes. Once done, the system should reboot automatically without an error code 1962. Once your PC loads, press and hold Shift button and click Shut down button from the boot menu at the same time. Press and hold the F2 button and click the power button. 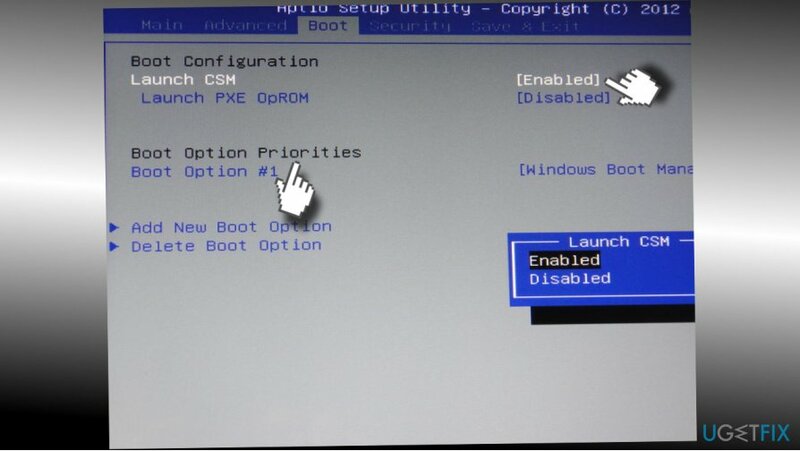 Do NOT release the F2 button until the BIOS screen emerges. Once BIOS opens, you can release the F2 button. Go to Boot section. If you cannot boot into Windows, perform 1-3 steps from the previous method. Open Boot section. Check the priority list. If the boot drive (SSD/HDD) is not listed at the top, shift it to the top instead of Windows Boot Manager, USB HDD or DVD Rom. Save these changes and close the BIOS. Once done, restart the PC. If these two fixes did not help and you are still facing “Error 1962: No Operating System Found” error, you can run Windows diagnostic tool at boot or perform a clean Windows install. In case you managed to boot into Windows successfully, you can also try to enable a System Restore Point. Go to the official Microsoft website and download Media Creation tool. Load the tool into a bootable flash drive or a DVD. Insert the DVD or connect the USB to the Lenovo computer displaying Error 1962. Once the Windows Setup window loads, select correct options for language, time and currency, keyboard output settings and click Next. ^ Kevin Lee. The best PC 2017: the best computers we've tested. Techradar. The source for tech buying advice. ^ Tim Fisher. Everything You Need to Know About Computer Hard Drives. Lifewire. Practical advice to help you live better with technology. ^ Tina Sieber. 5 Things to Consider When You Install a SATA Hard Drive. MakeUseOf. Technology website. ^ SATA. Computer Hope. Free computer help.